Reality Check! 2018 Gift Buyer’s Guide – You Know You Still Need This! With the Black Friday, Small Business Saturday and Cyber Monday madness behind us, it’s time to actually get serious about this stuff! At SHWAT™ we always wait until after that brief insanity to make our recommendations. Our theory is that with the onset of December the urgency to act for many of us means this is more timely than if we publish it with all the other noise happening around Thanksgiving. If you’re new here, you might like knowing that everything on this list has been vetted by our Pro Staff. Everything. And this year, the most affordable things on the list were designed right here, in house! Our stickers, shirts, hoodies, coffee mugs are all new, all exclusive, making them truly one of a kind gifts. But let’s start at the top, our most expensive (and arguably most awesome) recommendation. This is one of the best vetted bits of kit we’ve ever had. Over the last year Pro Staffer Jared Hilton has killed bobcat, coyote and wild hogs using this thermal optic. It records video so you can easily brag about your exploits. Its picture in picture sight picture is particularly great (and not as redundant as that reads!). This allows you to see both a more precise close up of your point of aim and a broader field of view so you know what’s going on around your target. You might just call that situational awareness. You’ll find references to this thermal optic many times over the last year here on SHWAT™. Several of us have used it, but Jared is the authority. See his Pulsar Trail XP50 Thermal Scope review for more. We found them available online at DFW Shooting Sports. For years I wanted to see what all the hype was about. Rumors about the 6.5 Grendel from the cool aid drinkers had been reaching me for quite a while. Then at SHOT Show a vendor dove into a tirade about how the Grendel was almost perfect but that it had a fatal flaw. Of course they had their own solution. That prompted me to place a call to Pro Staffer Dylan Saunders, an authority on many firearms related conversations and 6.5 Grendel guru. Rather than directly answering my questions, he coyly said to call the source and ask about it. After that one thing led to another and I ended up with the arrival of most awesome AR-15 we’ve ever had in the SHWAT™ collection. What makes it so awesome? The combination of the components and quality (For example, their trigger is fantastic and the build is tight!). And the caliber. The Grendel proved to be a laser gun, easy to use on running hogs at 200+ yards. For $1750 you won’t get the Cerakote job or buttstock that we did, but you will get one of my absolute favorite guns from Alexander Arms. 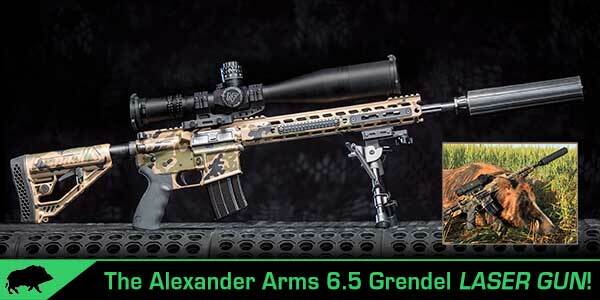 Check out my Alexander Arms 6.5 Grendel Tactical review for the bigger story. Okay, while a US Optics Scope for $1300 might look like a typo, it’s not. Several of our Pro Staff have US Optics and their comments have always been glowing. I remember SHOT Show a few years ago where they displayed a scope or two that had been dropped from a helicopter and shot through the side with a .22. They have a legacy of being super tough with great, high contrast super sharp glass. And a price tag to go with it. A year or so back I saw a prototype of this SVS 1-6x scope. It looked more modern than the other USO scopes I’ve run. The range was an improvement over the 1-4x I’d run. But one could only guess at what the price would be. Well, US Optics ownership changed and this scope is now available for $1299 directly from USO. For another $200 you can add a ZRODELTA 34mm mount. I just happened to have a leftover one in a box to show. As a hunting or tactical (or tactical hunting!) optic the 2nd focal plane reticle with an illuminated red dot work out nicely. You can dim the dot to night vision levels, but more importantly this optic is bright! Look through it and it’s just – wow! There’s a lot more to be said about this, and we’ll get to it in a longer review. Even as I type this I have grin. If you’ve been following SHWAT™ then you know I really l like the Remington TAC-14. I’ve hunted dove with it, done room clearing training with it, even made a silly TAC-14 Video. As much as I enjoy that little 12 gauge 870 derivative, bring on the semi-auto V3 TAC-13 Baby! I haven’t had a chance to properly review it here, but I have shot Crazy Quail clay pigeons with it. That’s a fast game and this is a fast gun! If the TAC-14 was “Too Much Fun” the TAC-13 is Way Too Much Fun! Well, maybe it’s a serious home defense gun. Maybe it’s bear defense with slugs. I’ve shot slugs and done mag dumps with this thing. Whoever you give this to, they are going to smile a ton. MSRP is $915, so you’ll find if for less no doubt. See Remington’s website for more on this V3 TAC-13. There are lots of nice cans on the market and we have a number of them. When it comes to making a suggestion to you, we only suggest what we’ve used. Not knowing what gun you have, what caliber, etc. we still can recommend something from Bowers. You’ve seen a lot of Bowers Suppressors coverage from us this year – Lots of social media stuff, stories here on the site, in our YouTube videos. It’s no surprise that these cans would end up here on the list. Suppressors aren’t the easiest thing to get or give, but several Pro Staffers and I have gotten to use these, both for fun shooting and hunting in several states. They aren’t fancy. They aren’t always the lightest or shortest. I can’t prove they are the quietest, but they actually are really quiet! I know, that’s not a scientific by the numbers statement, but numbers can be manipulated anyway. While Bowers is really pushing their super cool tiny .22 can, “Bitty” I’m really happy with their rifle cans. I’ve hunted with them on .458 SOCCOM, 50 Beowulf and 6.5 Grendel guns. Pro Staffer Erik Alexander has spent a lot of time with Bowers cans and Tom Bowers himself. Stay tuned for more from Eric about his experiences hunting with Bowers cans this year. 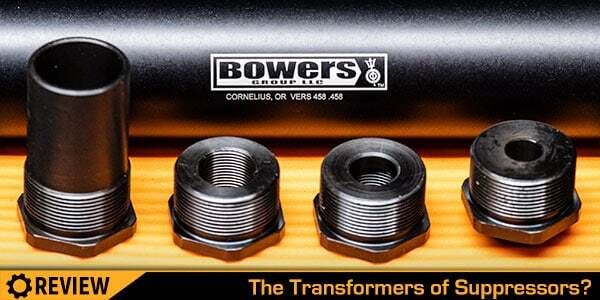 Click here for a few stories we’ve done with Bowers Suppressors. The Bivy Stick is something I’ve been watching for a while. The idea of adding satellite connectivity to my phone when I’m off grid is quite appealing. Not only have I hunted in some remote places, I also adventure in the Ultimate Hunting Vehicle, on a mountain bike and on foot. I reached out to Bivy Stick who then sent me the unit just in time for a battery of basic tests before this story went out. This thing is cool, and it works. As you can see from the pictures below, it works in the cold. It was in the twenties for the image on the left and fourteen degrees for the night screenshot on the right. When it comes to messaging, I tested that hitting up Pro Staffer Jared Hilton. He doesn’t have Bivy, nor the Bivy App. I texted through the app via satellite, he received and replied through his normal texting on his phone. That’s huge. You can’t surf social or the web at this point, or place a phone call, but you can track your position, send your position, use maps and check the weather through the satellite connection. SOS support is part of the deal. There’s no contract and the monthly plan is less than $20. The battery in the Bivy Stick will also charge your phone. Color me impressed. I haven’t had time to see where all you can purchase these, but obviously Bivystick.com is one. Guns and knives go together like peanut butter and jelly. Want to give a nice knife? This Bear OPS is a great option. It’s a solid build, and with it’s combination black G10 multi-layer composite and white smooth bone handle it just looks good. It’s a knife you could carry in the woods but will also match your tuxedo next time you wear it! Best part? It’s an auto knife. Push the button and out pops the blade. There are plenty of practical reasons why that’s a win, but if you’ve ever sat and clicked a ballpoint pen… Yep, this is better. The knife came in a nice box and sharp enough to cleanly cut a sheet of paper. If you live outside Alabama you’ll need to contact a dealer for this one, but you can check it out at the Bear and Son Cutlery website. Everyone needs an air compressor and portable wins the day for me. As part of our Ultimate Hunting Vehicle build with Extreme Terrain we got a Mean Mother portable air compressor. We’ve used it at home and in the mountains. The remote control is one of the best parts, allowing you to stop when the built in pressure gauge reads what you want though the compressor is ten feet away by the vehicle’s battery. We rescued a hunter this year using this and a couple of other UHV tools. Read my story where the Mean Mother saved the day and order one from Extreme Terrain here. SHWAT™ Style! Exclusive Shirts, Hoodies and More! Remington TAC-14 Not-A-Shotgun for Dove Hunting? Yeah, We Try That! This entry was posted in Special Hunting Weapons & Tactics™ - The Center of Gravity for Tactical and Long Range Hunting and tagged 6.5 Grendel, Alexander Arms, Bivystick, Bowers Group, Christmas, Gift, Remington, TAC-13, US Optics, ZRODELTA by Jonathan Owen. Bookmark the permalink.